TYPE: Narrative non-fiction (mixed), theoretical. SYNTHESIS: An overview of the history, science and philosophy of memory set against journalist Josh Foer‘s year-long sprint from memory virgin to 2006 U.S.A Memory Champion. We find it easiest to memorise things that are novel and visual. In short, exceptional memories are made, not born. This has been confused by the romantic and fanciful myth of “Photographic Memory”. Such accounts have always been explained by rare phenomena like synesthesia, eidetic memory or exaggeration. And even extremely rare “prodigious” savants always also exhibit an equally debilitating and profound disability. Why? Because forgetting is vital in separating the vital from the trivial. Memory is a delicate balance of retaining and recycling. The Method of Loci relies on visualising information as objects. Where information is not immediately visualisable (e.g., numbers, abstract words) it must first be replaced (encoded) with a stand-in, visualisable object. These objects are then linked to places within mental maps of well-known locations using a vivid (and surprising) mental imagery. Revisiting the locations, recalling and decoding an image at a specific location allows retrieval of the original information. Encoding abstract information into visualisable objects for use in the previous skill. Of the three, developing the third (systems for encoding) requires the most upfront work and practice. Systems like the Major System (to convert digits into words via sounds) or the Peg System (to convert numbers directly to objects) have existed for centuries. A common variant in use today is the Person-Action-Object (PAO) System which encodes e.g., playing cards or numbers as images of specific people acting on objects. All such encoding systems rely on the same basic principles but precise details and mental images vary between individuals. These take effort to create and internalise but make it easy to quickly learn almost any kind of information. Design immediate feedback mechanisms that tell you what’s wrong, how wrong and what you can do about it. As Josh’s year-long journey from memory-virgin to 2006 USA memory champion shows, it’s possible for almost anyone to use the ideas above to develop an exceptional memory. 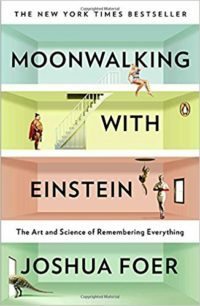 N.B., Moonwalking With Einstein an enjoyable and accessible read but, for me, a quick three hour skim was enough. If this is your first ever book on memory, or you’re reading for entertainment, then pick up a copy (great adds would be Ericsson’s Peak and Duhigg’s Power of Habit). If you want to improve your memory, read e.g., Lorrayne’s Memory Book or Cicero’s Rhetorica ad Herennium. Then turn to Google.